The concept of the netbook is a simple one, or at least it used to be. These little computers started off as cheap and cheerful numbers, with small hard drives and barely enough computing power to add up a child’s maths homework, but they were perfectly fit for their purpose. If you wanted to do some web surfing, write up a document or two and watch a video now and then but needed something truly portable, then the netbook was your go-to tool. Then netbooks started getting fancy, with faster processors and bigger hard drives, not to mention flashy designs, which were occasionally inspired by international fashion icons. Predictably, the price of these upmarket units climbed rapidly, but this wasn’t the end of the gilding of this once humble lily. There have been ultra lightweight premium models weighing in at half the usual netbook poundage, Apple has released an jewel-like 11-inch MacBook Air that is as delectable as an Italian princess (with a price tag to match) and to confuse the issue entirely, here we have Alienware’s ultra high performance netbook, the M11x. When I first heard about this device, I was very keen to take a look at it, if only to assuage my own curiosity. 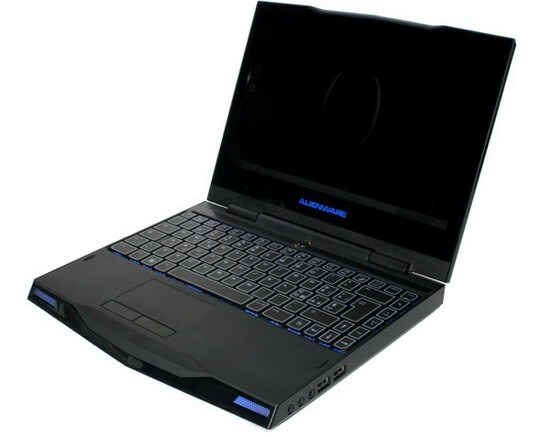 If Alienware make powerful (and expensive) gaming notebooks, then what on earth would an Alienware netbook be like? Well, the M11x isn’t much thicker than the entry level Acer netbook that I’m typing this review on, but it’s packed with substantially more computing power. Where my Acer (and most other netbooks) uses a low power (and low power consumption) CPU such as Intel’s Atom, the M11x boasts no less than Intel’s high end i7 multi-core processor. The M11x also comes loaded with no less than 8Gb of RAM, which is crazy talk for a netbook, as is the Nvidea GeForce graphics card. 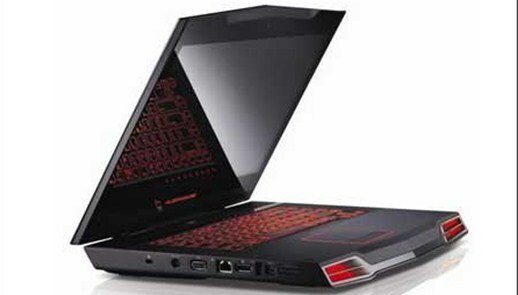 Then again, this is a genuine gaming netbook, which makes about as much sense as a polystyrene car or a barbeque made of paper. PC gaming is about big screens, monster sound systems and over the top, immersive experiences. So why would anyone need a gaming netbook? Believe it or not, some gamers are social animals and they like to take their computers out for a stroll to play against other gamers, either against some mates or at formal LAN gaming matches. So why lug around a desktop computer or a massive 18-inch gaming laptop when you can slip the M11x into a messenger bag and hit the road? Sounds like a good idea but the 11.6-inch screen is really tiny compared to something like a 23-inch monitor; close up however, despite its low screen resolution, it’s clear and bright, with a wide viewing angle and this makes it an acceptable if not ideal gaming platform.You can always plug the M11x into an external monitor using the HDMI jack when you’re at your home base. The M11x is a well built device, which feels more solid than the average wobbly netbook and it should prove to be durable in the long run. It’s a looker in the brash Alienware style, boasting bold angles and user configurable LED lighting that can be customised to change the colour of the vents, keyboard and touchpad. Even the little alien head under the screen can have its own special colour via the AlienSense control panel. There’s also a facial recognition based login system but it could never figure out who I was. Performance wise, the M11x lives up to its specifications, running more like a desktop replacement than a netbook. 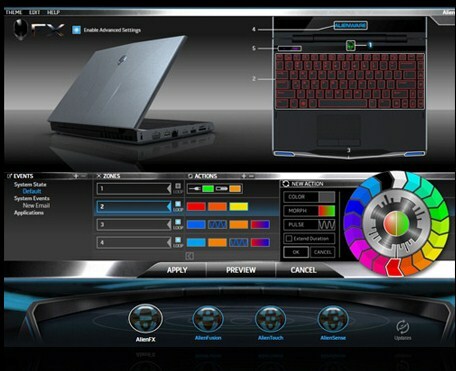 It whips through day-to-day computing tasks with ease, deals to HD video with disdain (albeit sized at the lower resolution of the screen) and crunches the 3D graphics calculations like a champion. Most gaming PCs will run in a narrow window of performance as dictated by their specs, and machines with similar components will be much of a muchness in terms of speed. As expected from the spec sheet, benchmarking proved that the M11x can run modern games seamlessly and it was an eerie feeling to watch a netbook display smooth 3D renderings that a normal Netbook couldn’t even begin to attempt. It won’t match a high-end gaming PC, but you’re going to look silly with a tower case under your arm on the bus. The M11x was totally reliable in use and never crashed, lagged or acted the goat. Battery life was very impressive considering the onboard grunt, so while I expected this computer to pack a battery- related sad early in the proceedings, it chugged along for far longer than anticipated. You pay a weight-related price for the performance, though the M11x feels like it’s got a hefty chunk of lead buried inside; it really is a dense beast but it isn’t unmanageable. The power supply unit is a serious brick, not a demure wall wart, so it adds yet more weight as well as some bulk. Even the power cables are thick and unwieldy. The other price that needs to be paid is of course the cost of entry. The M11x I reviewed comes in at $1799, the refreshed model carries a price tag of $2199, which is eye-watering in a netbook context.